Chalk Drawn Holiday Snowman PSD Background - Free Photoshop Brushes at Brusheezy! Enjoy the best of the holiday season with this new Chalk Drawn Holiday Snowman PSD Background! With this winter filled chalk drawn snowman PSD background you'll be able to send a festive message out to your clients, friends, and family. This snowman PSD is designed with beautiful snowflakes and some animal friends. Rather have the vector version? 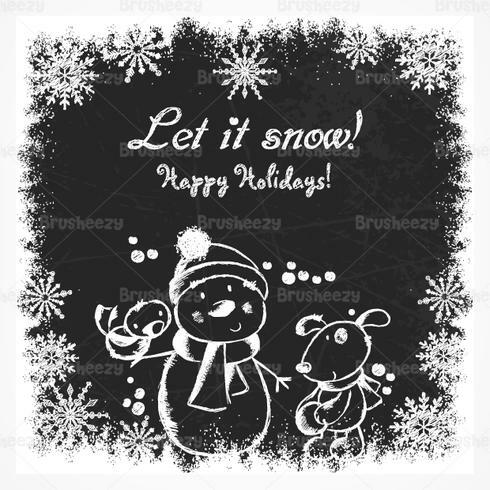 Download the <a href="http://www.vecteezy.com/holiday-seasonal/59451-chalk-drawn-holiday-snowman-vector-background/premium">Chalk Drawn Snowman Vector</a> over on Vecteezy!